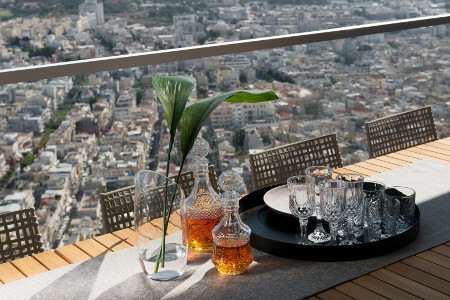 Israel Nottes Architects in collaboration with their client have designed a stunning private penthouse suite in the heart of Tel Aviv city. As an architect by the clients. The owners are a family consisting of both parents and their four children. When design started the clients asked to have apartments that would host s big parental suit, a vast public open space and three rooms for the kids. Above all, they asked to try and maintain their privacy as much as possible. The clients were very much involved during all phases of the design and construction. The design we proposed divided the apartment into three main segments. To the west, facing the sea, the parental area with a big bedroom, a study room facing the sea and walk in closet leading to their bathroom. To the east three rooms for the kids, each with its own private bathroom. A play room with Sony play station and X-box and big screen TV was designed at the entrance leading to the kid’s wing. In the south wing we proposed a big open space with a kitchen, long dining table and living room. The public space connects both wings and thus creating separation and privacy both for the parents as well as the kids. As our colour scheme, we decided on going with darker colours since the apartment is located very high and have complete panoramic view of 270 degrees facing from east to south to west and enjoy a lot of sunlight all day, almost every day. The floor is made from dark Oak wood to tone down the reflection of the sun light hitting it, the core of the building is covered with brass triangles of different oxidation phases, and this gives way to a unique pattern that at certain points creates many small David’s stars. The kitchen was ordered from Bulthaup due to their material section that allowed us to match the color schemes of the house. The three balconies of the apartment have different functions: the balcony to the west, facing the sea was designed for hosting guest; the long balcony to the south was intended for dinning and barbecuing as well with a lounging area. The balcony to the east is intended for morning coffee and breakfast. As architects we always strive to put into the design our finger print as much as possible, but previous experience thought us that first comes the client. A home means different things for different people and therefore we must respect it and act rather than dictating force as a leading tool for the client to discover its desired and wishes. 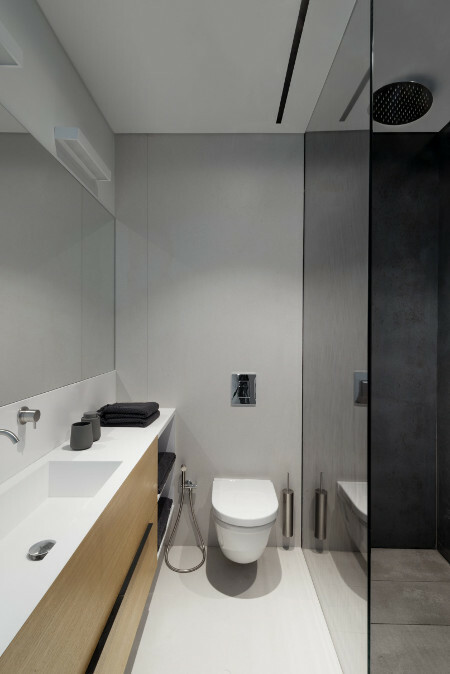 The project is located at the heart of Tel Aviv city, Israel, right in the middle of its busiest Avenue and consisted of two apartments joined together to create one big flat over half of a floor. The owners are a family consisting of both parents and their four children. When design started the clients asked to have apartments that would host a big parental suit, a vast public open space and three rooms for the kids. Above all, they asked to try and maintain their privacy as much as possible. The design we proposed divided the apartment into three main segments. To the west, facing the sea, the parental area with a big bedroom, a study room facing the sea and walk in closet leading to their bathroom. To the east three rooms for the kids, each with its own private bathroom. A play room with Sony play station and X-box and big screen TV was designed at the entrance leading to the kid’s wing. In the south wing we proposed a big open space with a kitchen, long dining table and living room. The public space connects both wings and thus creating separation and privacy both for the parents as well as the kids. As our color scheme, we decided on going with darker colors since the apartment is located very high and have complete panoramic view of 270 degrees facing from east to south to west and enjoy a lot of sunlight all day, almost every day. 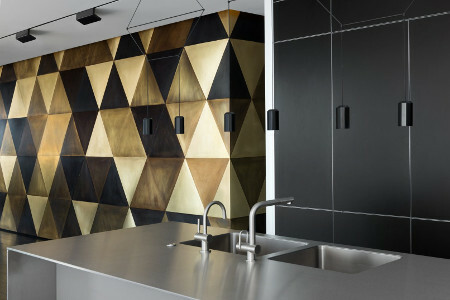 The floor is made from dark Oak wood to tone down the reflection of the sun light hitting it, the core of the building is covered with brass triangles of different oxidation phases, and this gives way to a unique pattern that at certain points creates many small David’s stars. The kitchen was ordered from Bulthaup due to their material section that allowed us to match the color schemes of the house. The three balconies of the apartment have different functions: the balcony to the west, facing the sea was designed for hosting guest; the long balcony to the south was intended for dinning and barbecuing as well with a lounging area. The balcony to the east is intended for morning coffee and breakfast. Working on the 36th floor in a high end building requires lots of technical creativity and the possibility to work like a surgeon without bothering the other tenants. Another issue was the core brass tiling. The core is made from concrete. Concrete and brass have a different expansion ratio which could end up breaking the tiles so we choose to glue them directly. In this case we made an exact model made from raw steel that was welded directly to the core of the building, next we glued the triangles on the steel carcass and this way we were able to achieve a clean and durable look without any screw or welding marks. Without a doubt the triangle tiles on the core for the reasons mentioned above. The extensive use of metal as a key element around the house, covering the core and pillars of the building was relatively new at the time we proposed it (circa 2014). It was not easy to find a proper professional who could guarantee us the outcome of this design.